Augmentin is an antibiotic, a type of medicine used to treat bacterial infections. Augmentin consists of a mixture of amoxicillin, a penicillin-type antibiotic, and clavulanic acid, a beta-lactamase inhibitor. Beta-lactamases are enzymes produced by some bacteria that provide resistance to antibiotics. Clavulanic acid prevents this process and makes the amoxicillin more effective. Augmentin is a broad-spectrum antibiotic, an antibiotic that is effective against a wide range of bacteria. It is prescribed by doctors to treat respiratory infections such as pneumonia, sinus infection, middle ear infection and bronchitis, bladder infection, meningitis, gastrointestinal infections and Lyme disease. Augmentin tablets should be swallowed whole with some liquid, preferably at the start of a meal to help prevent stomach upset. It is important to take Augmentin until you finish the prescription, even if you feel better. Stopping the course too soon may cause the infection to return. For children under the age of 12 the appropriate dose is determined by a doctor. If you have forgotten to take your Augmentin tablet, you should take it as soon as you remember, unless it is almost time for your next scheduled dose. Never take a double dose of Augmentin to make up for the forgotten dose. Augmentin is safe to use during pregnancy but you should tell your doctor that you are pregnant. It is also advisable to consult your doctor if you are breastfeeding. Augmentin is passed into breast milk in small amounts and may cause side effects in your baby. Augmentin may cause dizziness. Stay out of traffic if you are experiencing this side effect. 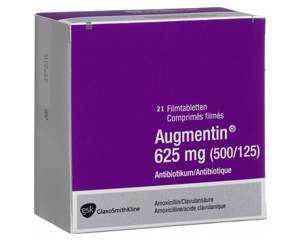 With Augmentin there are no food or alcohol restrictions.